This game simulation is a great 5-10 minute introductory activity to do with students when learning about antibodies and antigens. You are presented with three patients who need transfusions. The students draw blood and then test the blood by mixing it with vials of A antibodies, B antibodies, and Rh antibodies. They then have to select the bag of blood to transfuse into the patient. 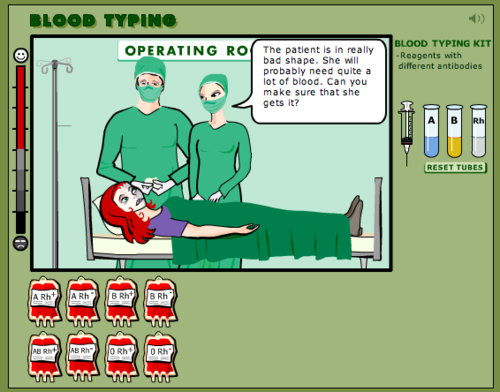 The reason that I like this activity is because when you get to the AB- patient, they end up needing four bags of blood and they only have one AB-. The students then have to decide which other blood types would be acceptable. The visual models of antibodies and antigens provide a good starting point for discussing antibody response. There are several other games for biology that you should check out on the Nobel prize website.